‘Food Wars’ Season 4 Release Date: Studio’s Other Bigtime Projects, Not Enough Manga Chapters Cause Announcement Delay? ‘Ash Vs Evil Dead’ Season 4: What is the Likelihood of a Fourth Installment Happening? Suri Cruise 2019: Will Tom Cruise Return to His Daughter’s Life Now That She’s an Adolescent? Justin Bieber, Hailey Baldwin Divorce Rumors: Singer Ditched ‘Pregnant’ Wife After a Big Fight? Kate Middleton, Prince William Divorce Rumors: Royal Couple’s Marriage Blew Up After Rose Hanbury Cheating Incident? The wait for the return of “The Walking Dead” season 9 will finally end in over a week. And before that happens, fans can now take a glimpse on episode 9’s opening scenes. “The Walking Dead” season 9 will return this year with the ninth episode, and the show will pick up right where things ended in 2018. The first few seconds devastatingly shows a lifeless Jesus (Tom Payne). He died from a sneak attack by one of the Whisperers. Daryl (Norman Reedus), Michonne (Danai Gurira), and the others are still trapped in the foggy cemetery and are being attacked by more Whisperers. They will lock the gate of the cemetery before running off. But since the Whisperers are actually humans, it does not take much time for them to unlock it. On a positive note, the protagonists will make it out alive (aside from Jesus) within the first minute of “The Walking Dead” season 9 episode 9 that will air on Sunday, Feb. 10. 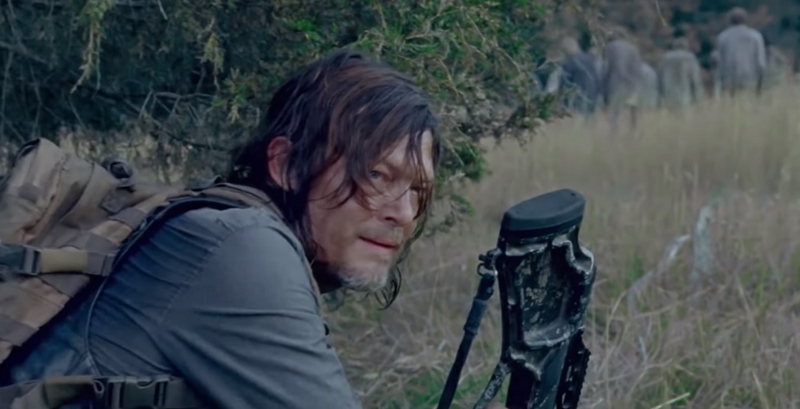 The other teasers for “The Walking Dead” season 9’s 2019 premiere shows Daryl and Michonne are taking home a prisoner. She is Lydia (Cassady McClincy), one of the Whisperers and the daughter of their leader called Alpha (Samantha Morton). The addition of the Whisperers has been a long time coming, especially for fans who are also familiar with the comic book source material. Without spoiling much of “The Walking Dead” season 9, the Whisperers are also survivors who skin the walkers they kill and use it as a disguise. The Whisperers blend in with the real walkers and attack other survivors’ camp to exploit their supplies and resources. Meanwhile, it is still a mystery how Negan (Jeffrey Dean Morgan) will into the upcoming plots with a new threat ahead of “The Walking Dead” season 9.